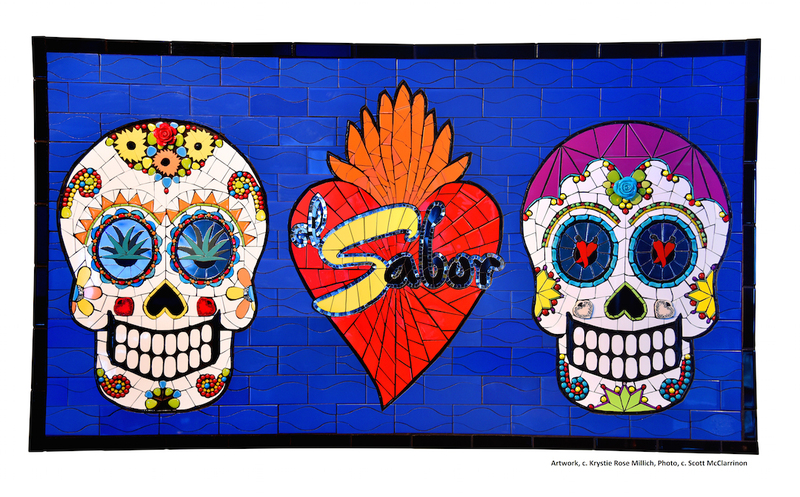 c. 2015, for el Sabor restaurant. Mixed-media mosaic, 72”w x 48” H x 3” deep. Glazed ceramic tiles, mirror, glass gems and tiles, and various found objects on backer board. 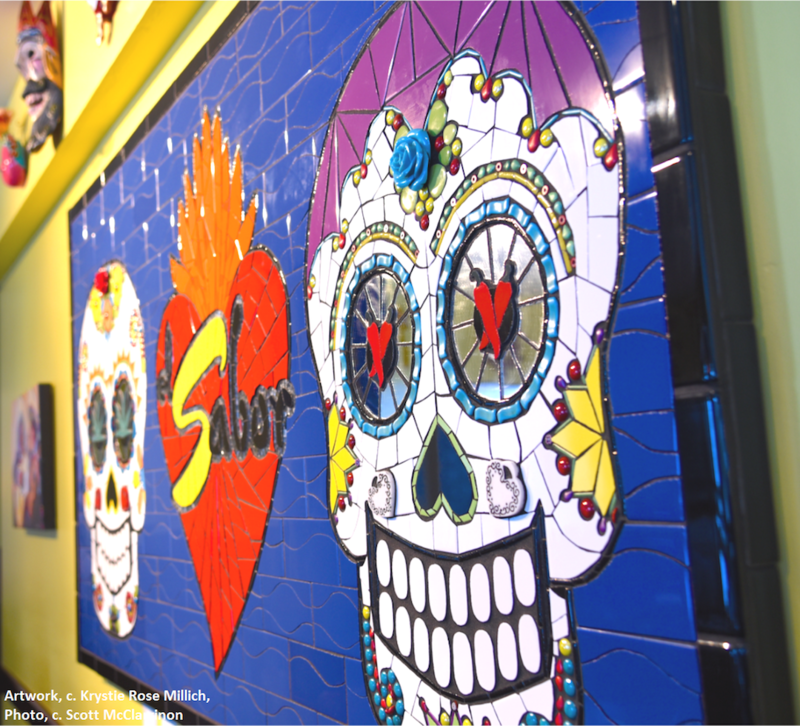 This mosaic wall mural was commissioned by el Sabor restaurant in Vail, Colorado, to reflect and illustrate the background and environment they would like to share with their customers. 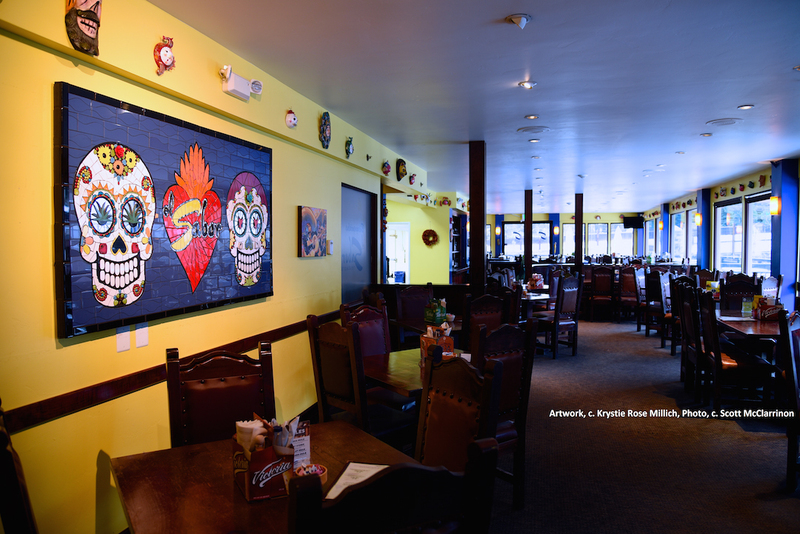 The theme of the mural centers around the long-standing Mexican and Latin American holiday of “el Dia de los Muertos” or “the Day of the Dead”. Followers believe that the spirits of the departed are allowed to come and spend time with their loved ones on these special days. It is not a morbid, sad holiday, but rather a celebration of the human spirit and the culture’s beliefs around the circle of life and the connection between life and death. Families and friends of the deceased gather to remember and pray for the spiritual journeys of their lost ones and construct elaborate altars in their homes and/or cemeteries. Altars are designed to reflect the personality and life of their loved ones and include photos, hobby- and interest-related tokens, and treasured keepsakes, as well as “offerings” of favorite foods and drinks for the returning spirits. Gatherings often include visits to the cemeteries of the deceased, where, in a celebratory, party-type atmosphere, whole communities visit, clean and decorate the graves of their loved ones, and enjoy food, drink, and activities meant to honor the deceased by celebrating life. Through these activities of recounting family stories, fun times and lessons learned, children and families are able to celebrate not how the person died, but how they lived. 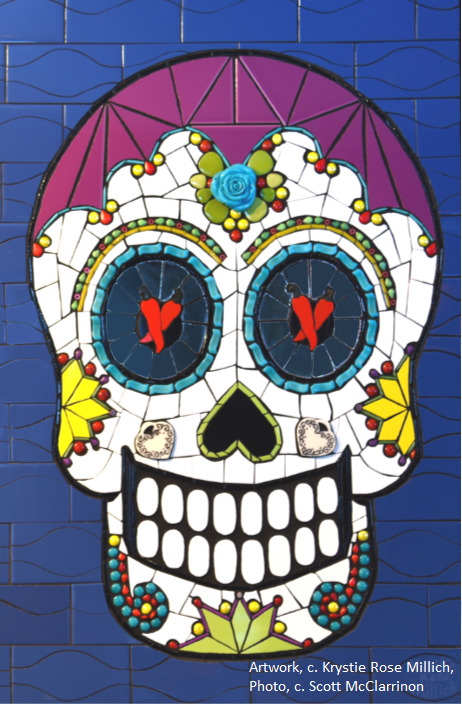 Mexicans consider death a normal part of life, and this belief manifests itself in all aspects of popular and cultural life in Mexico, including the art of “sugar skulls” as seen in this mural. 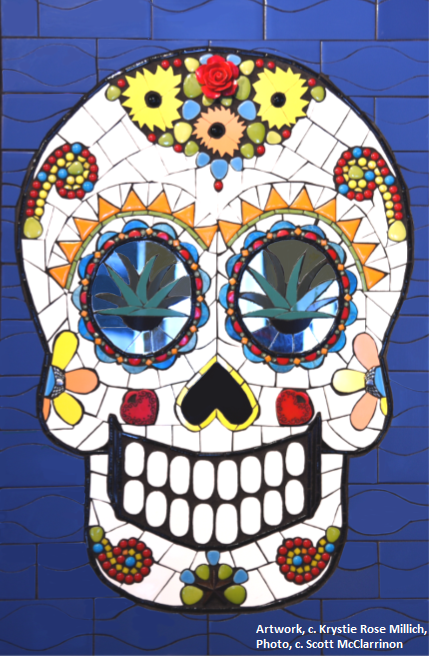 Making fun of death is very common and involves images and art such as sugar skulls that ridicule and make fun of people, life, and death. 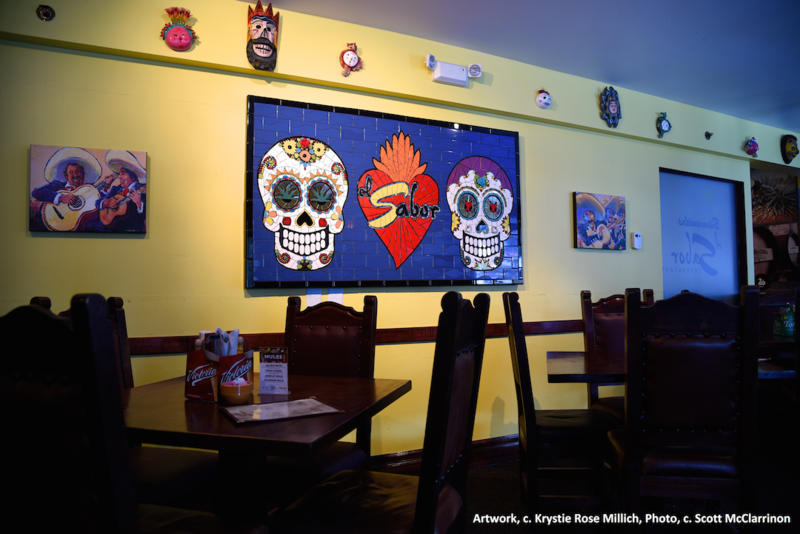 The vibrant, whimsical, funny nature of sugar skulls reminds people that life is impermanent and death is inevitable, so we should celebrate and fully live each day that we have.